While we're on the topic of chemistry, we have a number of other calculators what you might find useful. Why not check out our molarity calculator or our percent yield calculator. A mole is small, subterranean mammal belonging to the family Talpidae. Just kidding. A mole is how chemists define an amount of substance, useful when dealing with many different molecules reacting at once (i.e. any reaction). The official International System of Units definition is that a mole is the amount of a chemical substance that contains exactly 6.02214076×1023 (Avogadro's constant) atoms, molecules, ions or electrons (constitutive particles), as of 20th May 2019. Prior to that, a mole was defined as the number of atoms in 12 grams of carbon-12 (an isotope of carbon). Turns out that memorising that definition for my GCSE chemistry exam was pointless. Shame. If you wanted to find the concentration of the hydrochloric acid, you could use our concentration calculator. So we now know we need 10.8 g of NaOH to exactly neutralise our amount of hydrochloric acid. 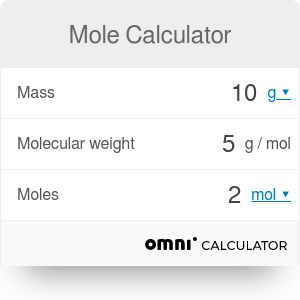 We hope this grams to moles calculator (or moles to grams calculator) will help you with your chemical calculations! You may also find our titration calculator of use to you. Mole Calculator can be embedded on your website to enrich the content you wrote and make it easier for your visitors to understand your message.